Skateboarding forces you to come to grips with your balance on a moving object, and it works your core. I GENERALLY FEEL like I can learn most sports. I know muscle memory and repetition work. I might not be the best or most graceful, but if I apply myself, I’ll pick it up in some fashion. 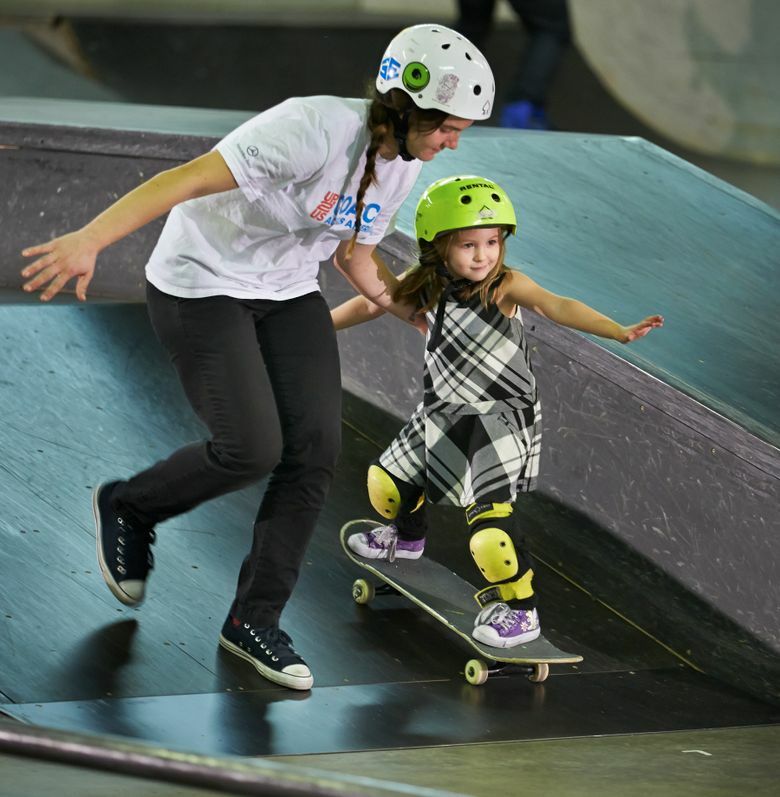 But I had a few moments of serious doubt during my skateboarding class, watching kids, teens and adults careen around the ramps and concrete floors. I wondered if there would be any outcome other than bruises and a shattered ego. I went to All Together Skatepark, an indoor park in Fremont, to try. I’m not the best on wheels, but I like a challenge. Unlike kids who skateboarded growing up, I hopped on my neighbor’s skateboard just once, with disastrous results. I haven’t tried since. The skatepark hosts a girls-only night on Mondays. Students ranged from a tiny 6-year-old to adults outfitted in knee and elbow pads, wrist guards and a helmet. Ahem. The class was split up based on what people wanted to learn. In the newbie class, we worked on the basics of pushing and learning to cruise. Pushing straight ahead on the skateboard was fun. Getting set sideways on the board in the proper place to cruise also was fun. Figuring out how to push and then quickly turn my feet to cruise, well, that was not my greatest moment. I also had a tendency to lean on my back foot, which made me tumble off a few times. Before I was quite ready to go faster than a snail’s pace, our teachers announced we were going down a small ramp. They told us to lean into our front leg on the downhill, which I know from snowboarding. But the reptilian, nervous part of my brain was not into the lean. Instead of shifting forward on the downhill, I leaned back and lurched off. It took a couple more rounds to glide down and stay on the board. We also learned tic tacs, moving the skateboard side to side. We graduated to cones to work on our control. But what I needed to work on most was pushing and cruising. Skateboarding forces you to come to grips with your balance on a moving object, and it works your core. I had moments where I figured out moves, like jumping to flip my upside-down skateboard to upright and landing squarely on it. I found I preferred going up a ramp for a move called a fakie. Leaning on my back foot on the uphill felt natural, though coming down required shifting my weight back toward the downhill so that I didn’t take out my 17-year-old teacher, Luna, who ran with me. For our final move, she took us to the top of a steeper ramp. She told us we could do it. I was doubtful. On the first run, I rolled down the ramp and tumbled off my board, taking Luna with me. Sorry! She wanted me to try again. Teenagers. On our second round, she told me to bend my knees deeply, reach my arm down toward the ramp and lean forward. We not only made it down, we rolled up onto another, did a fakie and made it back. I was surprised, and somewhat relieved. We did it a couple more times until I felt confident. I still didn’t want her far away. I have a lot to work on with skateboarding. By the end of class, I also knew practice would make the difference. With enough time, I bet I could even roll down a ramp solo.